This past month I was full of motivation for working out. I'm not sure where it came from, but I'm definitely not complaining. I wish every month could go so smoothly. Unfortunately, motivation (at least at this level - for me) can be fleeting. As the days get shorter, I have been forced to either do my morning run on the treadmill, or run in the dark. I've been opting for embracing the darkness, and I do have a little gadget that helps me out. 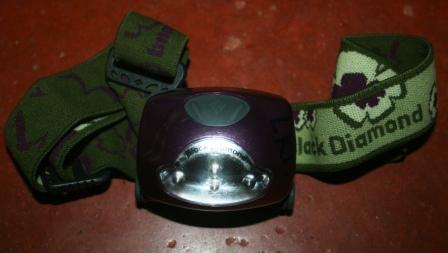 I've had this Black Diamond headlamp for almost 10 years now, and I love it. The light adjusts, so you can angle it towards the ground just right, it's a solid brightness, and it's lightweight. Total running mileage this month was 113 miles. This included one 10K (which didn't go so well, as you may remember, but it was okay) and two track workouts. I would've liked to hit the track more often, but it just didn't happen this month. No complaining this month about a lack of crosstraining - I managed to live up to my own standards for once, ha ha. Hoping for a similar month in September with a return to a long run or two, and more track workouts. I have another 10K coming up, and I hope to run faster than my August 10K. Got any goals for September? Exercise or otherwise? Let me know in a comment, I'd love to hear about them! I am cheering you on for the motivation to continue! That's awesome! I recently started running again and my goal is to run at least 3 times a week! Now that JDaniel is in preschool I can go back to the gym. Your workout schedule this month sounds like it went well. Excellent, you had a great month! Way to go, Lisa! You ROCK, girl! That is amazing! I bet your boys love that head lamp! Usually I would start fall garden in September but there is no way that will be possible unless the weather drastically changes. LOVE those headlamps..we use them for camping quite often! My August was kind of blah with fitness, so all the pressure is on September! Lisa, you are so inspiring! I just hired a trainer that I start with on Tuesday. Just going 30 minutes 1x per week to start with and then on my own at home doing stuff more. I need to start somewhere! You are just as fit as a flea, Lisa. Maybe you have to be to keep up with those energetic kids of yours. I am impressed and totally amazed and VERY Jealous! I wish I could run that much, I'm more of a really fast walker which I call a jog and I max out at about 1/2 a mile :) Keep up the good work! I haven't really thought about any goals for September. I'll have to think on that. Great job on the fitness/running routine in August, Lisa. Well done!! Wow, you are one committed lady! My goals for September? Clean the toilet and straighten up the linen closet! Pathetic, isn't it? I want to try to shape up my eating habits and walk more. The headlamp is a great idea, and I also have these reflective arm bands that stay on with velcro-just to make myself more visible at night. Way to go on your accomplishments, too! You're brave! I'd be afraid to run in the dark! Wow. Here I am whining about my dinky 3 mile run for my black belt training/testing. Sheesh. Congrats, Lisa. I am proud of you.. My goal for September: WELL---we're hitting the road again for a couple of weeks, so I guess my goal would be to have fun and stay safe!! Wow Lisa! I mentioned you on my blog today. Stop by to view. Luv! So, I'm afraid to run in the dark, and I saw other runners wearing this lamp on their head, and I kind of laughed at first, but it makes sense! Good job on your mileage! 113 miles - whew! Great job! Good post Lisa. I just interviewed a woman who completed a cross country journey on a bicycle. A journey of 4200 miles and 83 days. She turned 60 on day three of her trip. She looks like a gymnast and the story she told me is remarkable. As we age, we have to make fitness a priority. I admire you. I agree with blueviolet. Unless I could run FAST that is. I am getting back into the grove now that the temps have cooled some and the garden has given me a slight break. Feels great! You're awesome--113 miles! I used to run in the early mornings. I loved it, BUT I would get all jumpy anytime a person or car passed. My goal for the month is just to start exercising, anything! You really should meet Dawn at Just One Life. She runs mountain marathons. Sorry, I just realized I was logged in with my other email account. WOW~! 113 miles.. So proud of you ~ good job~!~! I love when you write in your post about your training that you do to get ready for a big race. You motivate me to do my walking everyday. I have lost 35 pounds and I'm wanting to lose 10 more. I love that light that you wear for running in the dark. That would be a great light I could use for geocaching in the dark.